The perfect appetizer for a hungry crowd! 1. Preheat oven to 350°F. Heat oil in large nonstick skillet over medium-high heat until hot. Add bell pepper and onion. Cook, stirring frequently, for 3 to 4 minutes or until tender-crisp. Remove from skillet and keep warm. 1. Season beef steaks with steak seasoning. Heat same skillet over medium-high heat until hot. Place steaks in skillet. Do not crowd - cook in batches, if necessary. Cook 8- 12 minutes or until desired doneness, turning once. 1. Meanwhile, place rolls cut-side up, on baking sheet. Place cheese on roll bottoms. Bake 3 to 4 minutes or until roll tops are toasted and cheese is melted. 1. 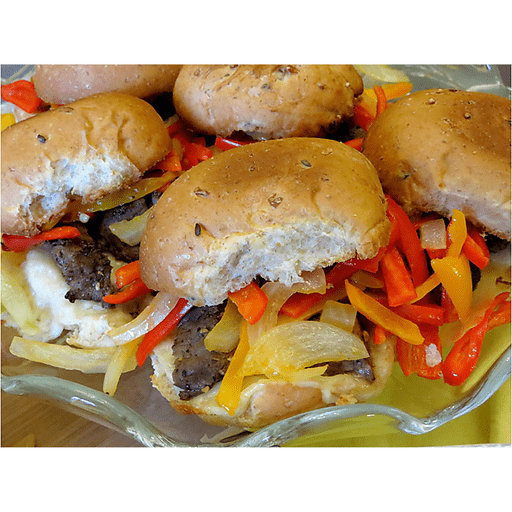 Arrange beef evenly over bottom of each roll, cutting steaks, if necessary, to divide evenly. Top evenly with bell pepper and onion mixture. Close sandwiches and serve warm. For gluten free: Use gluten free rolls in place of multigrain dinner rolls. Calories 260, Total Fat 10g (Saturated 4g, Trans 0g), Cholesterol 45mg, Sodium 540mg, Total Carbohydrate 23g (Dietary Fiber 3g, Sugars 4g), Protein 19g, Vitamin A 15%, Vitamin C 150%, Calcium 10%, Iron 15% *Nutritional values are an approximation. Actual nutritional values may vary due to preparation techniques, variations related to suppliers, regional and seasonal differences, or rounding.